Writing in the aftermath of World War II, the philosopher Hannah Arendt warned that "the problem of evil [would] be the fundamental question of post-war intellectual life in Europe." For a considerable period, Arendt's prediction failed to become a reality. Although the horror of the Nazi regime left an indelible scar on the European psyche, evil as a concept faded. Only in the past couple decades, with internationally condemned outrages such as the Rwandan genocide, Srebenica and 9/11, has evil re-emerged in international debate. George W. Bush and Tony Blair used the word when justifying the attacks on Afghanistan and Iraq. And in his Noble Peace Prize address, Barack Obama said, "Make no mistake, evil does exist in the world." While this "evil" may be a real threat, other evils are currently blighting the lives of hundreds of millions, if not billions, of people around the world: mainly poverty, hunger and inequality. Although there are debates as to how to measure poverty, the fact that 2.6 billion people live under $2 a day gives some indication as to the scale of the problem. This poverty is not simply detrimental to the quality of life of those trapped in such circumstances but greatly diminishes their chances of living at all. According to the U.N. Millennium Project 2005 report, the life expectancy of those living in households suffering from extreme poverty is only 40 years, compared to the 80 years people in the developed world can look forward to. For children, too, the situation is grim, as over 10 percent die before their first birthday, with some 10.6 million children dying before the age of five. In spite of the lauded technological developments and progress achieved in the 20th century, the world was confronted with a worldwide pandemic of hunger at the start of the new millennium. Up to 790 million people lacked the most basic food security, with some 284 million of these in South Asia, 242 million in Southeast Asia, 180 million in sub-Saharan Africa, 53 million in Latin America, and 33 million in the Near East and North Africa. Given the increase in wealth and economic developments of the previous century, the deaths of 20,000 people a day from the effects of hunger must surely rank amongst the greatest outrages of our current era. Even more shameful is the fact that the hundreds of millions wasting away from hunger-related deficiencies live in areas where agriculture would produce enough food for everyone. The inability on the part of the hungry to access locally cultivated food crops is largely a consequence of our current global economic structure. In many countries in the Southern Hemisphere there has been a significant rise in export-led crop production, often encouraged by the international financial institutions, which has resulted in agricultural produce being exported as local people go hungry. Also, many hungry people don't have the money to buy food that is locally produced. The ongoing "food crisis" has greatly aggravated this problem as well over the past several years. 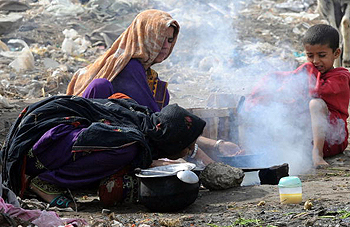 Allied to these modern plagues of hunger and poverty are the staggering levels of inequality. According to the 2005 UNDP HDR, in 53 of the 73 countries for which there are accessible data, containing over 80 percent of the world's population, there was an increase in inequality, with only 9 countries seeing these disparities contract. The trend held true for both high- and low-growth countries across all regions. This growth in inequality has not been limited to the international stage but is mirrored within states themselves. In the United States, for example, as of 2007, the top 1 percent of households owned 34.6 percent of all privately held wealth, and the next 19 percent held 50.5 percent, which means that 20 percent of the people owned 85 percent of the wealth. According to the Gini index, inequality has risen consistently both between individuals and households. Today's disparities in wealth and income are unprecedented in human history. They have become almost grotesque in their magnitude and the manner in which they condemn so many worldwide to live in squalor without any feasible possibility of enjoying the fruits of humanity's economic, cultural and social achievements. It is highly unlikely that the evils of poverty, hunger and inequality are likely to disappear anytime in the near future. Despite international aid initiatives, such as the Millennium Development Goals, which aims at tackling the problems of poverty and "underdevelopment" globally, the outlook is bleak. While progress has been made on certain fronts—towards universal primary school enrolment, for instance—others such as the targeted reduction in child mortality have proved far more elusive. Furthermore, the current economic crisis has had a disproportionate impact on those already most impoverished. According to the World Bank's 2009 Global Monitoring Report, the current international recession is reversing progress made in reducing the number of chronically hungry people, as their number soared from 850 million in 2007 to 960 million in 2008, with a continued rise to over 1 billion expected in 2009. Given these facts, it is obvious that there is an urgent need to tackle the evils of poverty, hunger and inequality both in the developed and developing worlds. However, the tendency for the political spotlight to focus on evil as signifying the malignity of extremists allegedly striving to destroy our way of life, has diverted the attention, efforts and resources required to successfully tackle poverty, hunger and inequality. As Worldwatch pointed out in its 2005 State of the Worldreport, it is these "old evils" of poverty, hunger and inequality that are in many cases the root causes of the evil referred to by politicians like Bush and Blair. Therefore, if we are truly serious about making the world a safer and more humane place for all, poverty, hunger and inequality are the real evils we should be struggling to eliminate. View the Worldpress Desk’s profile for Justin Frewen.